“If we could collect data on people over a period of time, we could look at changes in their social networks to understand when and where and at what moments people become more at risk of suicide,” said Eric Rice, USC CAIS co-founder and associate professor at the MSW@USC. Researchers will interview 200 to 300 soldiers during their six-month deployments and the next six months at home. They will watch for changes to social networks and engagement with battalion members to identify signs of suicidal thinking and potentially develop new interventions. To hear more from Dr. Rice, listen to “Listen.Up.People.,” a new podcast from the USC Suzanne Dworak-Peck School of Social Work which highlights the topic of suicide as a public health crisis in the first episode. How is suicide affecting the veteran population? 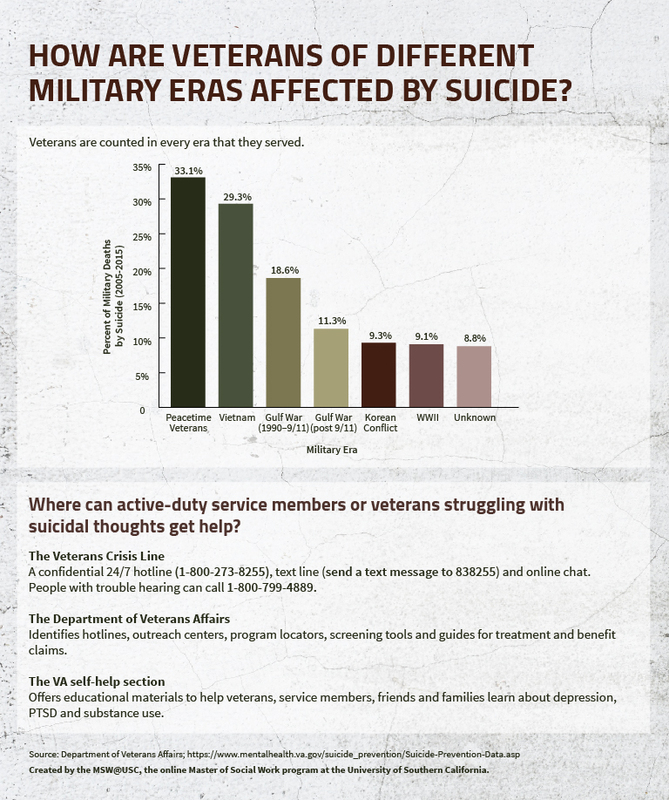 The MSW@USC, the online Master of Social Work program at USC, answers this and other frequently asked questions about veteran suicide below. Visit the USC Suzanne Dworak-Peck School of Social Work Military and Veterans Programs page to learn more about what the school is doing to advance the health and well-being of our nation’s service members, veterans and their families. The MSW@USC is the Online Master of Social Work program at the University of Southern California, which opens doors to fulfilling careers across a range of fields, such as mental health, family counseling, and military and community advocacy. This post originally appeared here on the MSW@USC blog. I think people are like Aspen trees and we need to be conected by our root system…or we die.